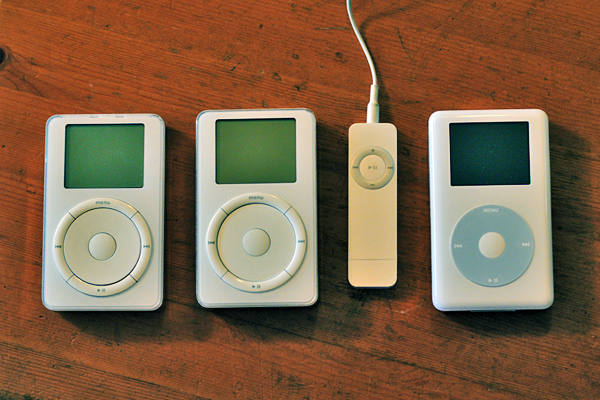 This could be the biggest shock to the industry since the iPod, argues TuneCore. Photo (CC-BY-SA) strollers. Jeff Price, writing for TuneCore, has a different take on Apple’s iCloud. He thinks it will both transform the industry and shift consumer listening from downloaded files to streams. That would mean I’d have to substantially revise my knee-jerk take following Apple’s announcement – and his line of thinking would raise questions about whether dividing up a $25-a-year fee will leave much of a revenue stream for artists. You can read Apple’s description of the product on their site. Correction: while TuneCore claims iCloud’s music functionality is streaming, Apple has only confirmed file sync capability – you play music from local storage. Indeed, Apple touts the ability to download and to listen to music matched on iTunes Match as 256k AAC files. Re-downloading uploaded files is possible only with Apple — and yes, that includes files you pirated. Price believes that this “provides the feeling of owning what you are streaming.” But that could be bad news for artists who depend on the “ownership” feeling coming from buying from stores like Bandcamp. Confirmed: Price is at least partially mistaken. Amazon allows re-downloading files, though it’s worth noting those are files you’ve purchased from the Amazon MP3 store — Apple’s functionality is indeed different. What’s entirely incorrect, based on the service in its present state, is the assumption that you stream files. While that’s true of Google and Amazon stores – and while those services might assist the kind of streaming preferences Price describes – Apple isn’t streaming, or at least isn’t doing so yet. Why would this transform the landscape? Two things: one being increased lock-in to Apple’s products, Price argues. While there’s no new DRM, the automatic download as AAC renders files incompatible with some non-Apple players. (I disagree here – AAC compatibility could simply become more widespread, and even now, it’s not limited to Apple.) I think sheer iCloud compatibility could increase Apple dependency, however – and to the iTunes store, too, which is essential to TuneCore’s business as a gatekeeper for unsigned artists. The bottom line here is whether consumers buy in and adjust their listening habits. If they do, Price could be right – we could see a shift from downloads to streams, an income shift from purchases to royalties, and even greater dominance of Apple over how people consume music. Notably, because of the lack of licensing deals, Apple might be without competition. My big fear: those shifts could ultimately mean that only artists with lots of plays get revenues, which again would tilt the scales to big artists. The charts would simply be on your iTunes players, not on the radio. We’ll have to wait and see; stay tuned as I hear from more people close to the iCloud deals and product. Updated – one last thought for the day. If you’re wondering how you can split up a $25-a-year fee and provide streaming, a simple answer may be, you can’t. It’s possible TuneCore is simply dead wrong, because it doesn’t seem that the math for licensing fees would add up. Apple, for their part, never mentions streaming. But I am at least partly comforted in my fears about streaming becoming the norm at this absurdly-low price by the evidence that this isn’t a streaming service to begin with. Ahem. Again, confirmed: Price is making an argument that appears to be divorced from the present facts, though it certainly remains possible a future version of the service will stream. (Given the service isn’t due out until the fall, it’s even possible the final version will ship with that functionality.) In his defense, the question of whether Apple’s service provided streaming seemed to confuse everyone. While it was the single most-anticipated portion of the WWDC keynote, Apple left demos and description to the end of a marathon set of demos of Mac OS and iOS features, and then showed a service that wasn’t complete. That has surprised some onlookers (see our comments), given that many people expect Apple to keep functionality under wraps until it’s fully baked. (Contrast: Google, who regularly release experimental and “beta” products.) Since Apple never specifically debunked rumors their service streamed, some people conflated rumors (and features of rival services) with what Apple showed. While TuneCore hasn’t posted an update to their blog, we’re blessed with the ability to post updates online. For now, the iCloud doesn’t stream. Price’s arguments remain a perspective worth considering because a future iteration might stream, and rival services make it a cornerstone feature.